DeGeest highlighted the new features of its Tea facility, including the automated technology it uses in the process of its custom steel manufacturing. Advances in laser technology and robotics have made major strides in recent years, changing the nature of steel production and how DeGeest fills the orders of its customers, according to company president Scott DeGeest. He and his son Derek DeGeest, the company’s vice president, led McMahon through much of the building, taking extra time to show her newer equipment such as robotic welders. DeGeest Steel Works is a third-generation family-owned business, founded by Scott’s parents Clint and Glenyce DeGeest in 1976. DeGeest is also growing, thanks in part to financing from FDDC, SBA and First Premier Bank of Sioux Falls. It doubled its square footage in 2014 with a move to its current facility in Tea. Now, the company is expanding its floor space to 135,000 square feet. 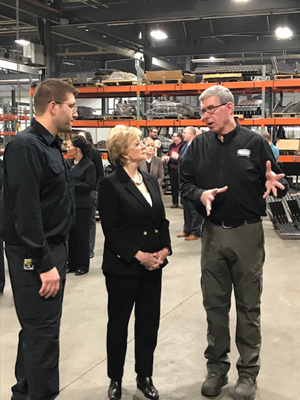 Above left: Linda McMahan, head of the U.S. Small Business Administration, gets a tour from Scott and Derek DeGeest at DeGeest Steel Works Co in Tea, SD. 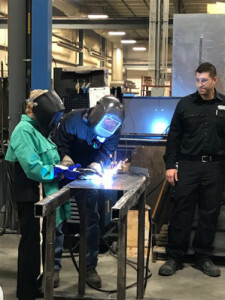 Bottom right: McMahon (behind her protective gear) welds a custom nameplate with her title below as Administrator of SBA.